Today I undertook one of the most physically challenging activities of my life! 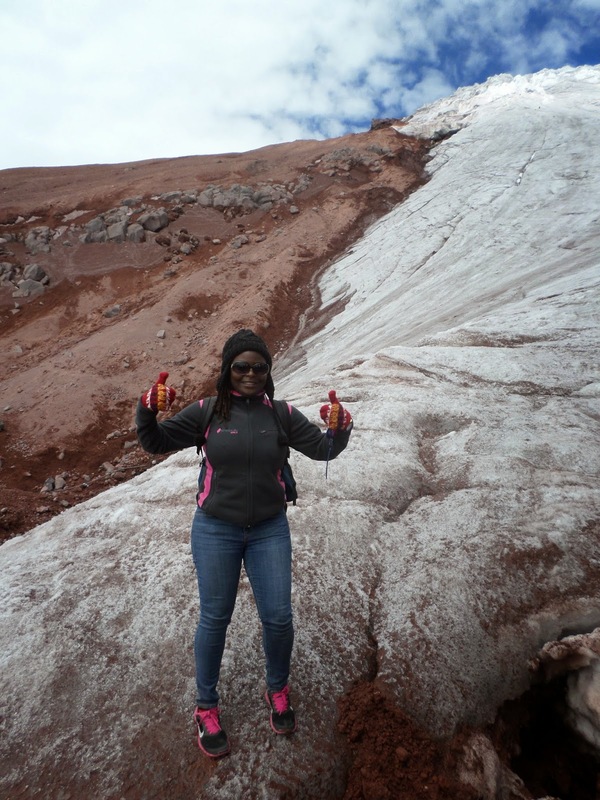 I went up one of the world's highest active volcanic mountains, Cotopaxi. I did not go all the way up though but went up until the beginning of where the ice/snow is as you can see in the picture. This mountain is the second highest in Ecuador and stands at more than 5000 meters above sea level, I can't tell you the exact numbers but just know it's 5 thousand and something. 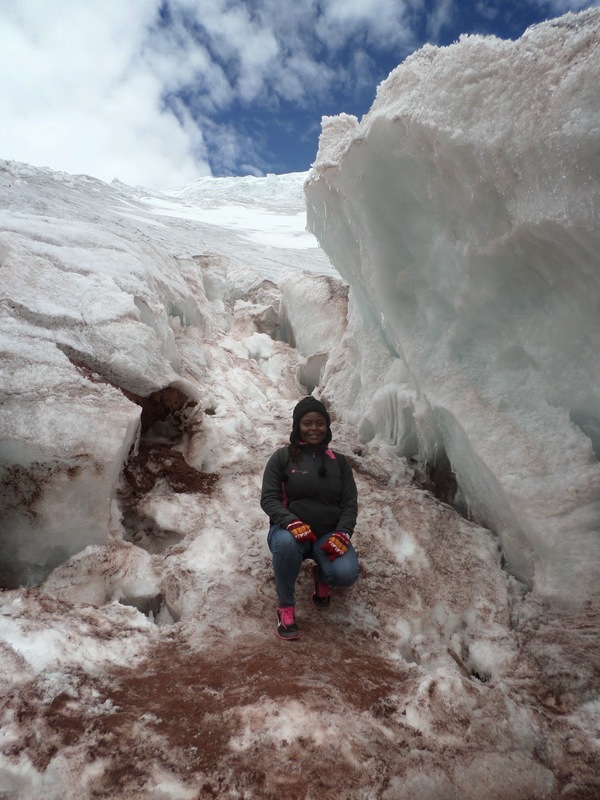 Since I am on a quest to experience as much as I can on what Ecuador has to offer in terms of it's diverse terrain, I figured Cotopaxi would be something worth checking out. 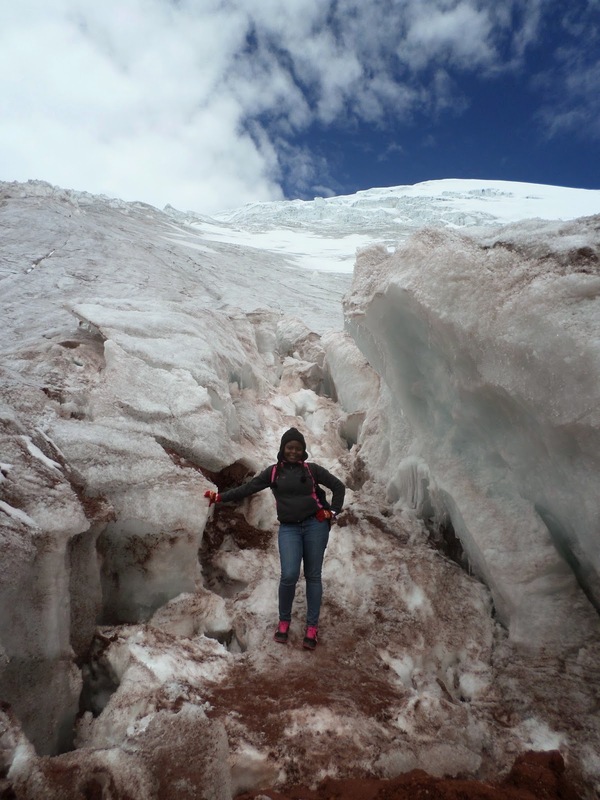 The mountain is about two hours away from Quito making it very convenient and there are tones of tours available to Cotopaxi, the tours are cheap too! average price is $45 and it includes transport from the city and back, park entrance and lunch. As we got near to Cotopaxi there was definitely a change in weather. It was very windy and felt colder even though the sun was out. The winds were actually pretty strong! we stopped right before getting to the mountain to take a group picture as our guide gave us a bit of history about Cotopaxi and the surrounding area. He also warned us to take it real easy and walk slowly because of the high altitude and potential for altitude sickness. When we got to the base there were a lot of people who were also climbing while some were coming down. Since it was a Sunday there were lot's of families and I was surprised to see really young kids going up too. 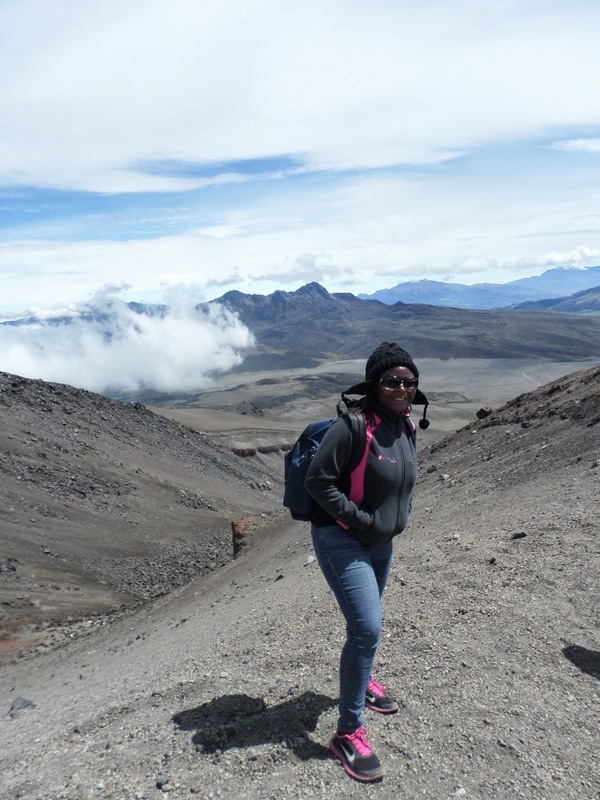 Once we begun our hike up Cotopaxi, I was already breathless and panting within the first 5 minutes because of the altitude. You should have seen my face when our guide told us it would take one hour to get to our first stop. One hour doesn't sound bad at all on flat land and lower altitude but in this case, one hour seemed like forever. On top of the breathing issues we had to deal with the tough hike up on loose slippery soil. I am not even going to lie, I wanted to give up and turn around but I pushed myself to go on plus seeing really young kids passing me by gave me the motivation to tough it out. Don't even ask me how I managed a smile in the picture below at our first stop because I was panting like a dog and just about ready to collapse. Shock on me when the guide told us that we had more climbing to do. To be honest I hadn't realized we were going to go further up to the ice at the top but I figured since I had already made it this far, why not continue. The second leg of the climb was shorter than the first so that was encouraging. Finally at our second and last stop before descent. Ecstatic! I made it y'all. We hang out at the second stop for a while to rest and take pictures before heading back down. Going down was easier than going up but it was still challenging. Remember we were walking on loose soil so going down you risked the chance of losing your footing and falling down. I was very careful and proud of myself for not falling even once but I did end up falling near the base of the mountain, it was more funny than painful. That's it folks, after the climb we got some well deserved lunch before heading back to the city. I was tired, my legs were shaking and I had more respect for mother nature. She is a force to be reckoned with. I will never ever climb a mountain again in my life! don't get me wrong, I am glad I experienced Cotopaxi and I am proud of myself for facing and overcoming the challenge but frankly speaking I never want to physically feel like how I did today, ever again. There were lots of wild horses near Cotopaxi, the sight was so beautiful. Buses here have a problem with emission. Every time a bus drives past me I feel like it just farted on my face because of the amount of emission that follows. Not cool at all. I am debating on whether I should check out the jungle or not. Okay I have to admit I can be a little high maintenance, I like to be comfortable so I like a warm clean bed and a nice clean bathroom at the end of the day. I am just not sure about the conditions in the jungle. Plus when I think of heat and mosquitoes I am just not feeling it. On a day like today I am so glad I got to go back to a nice hot shower because I needed it. Tomorrow I am sure my legs will be so sore. Since being here in Quito I have noticed my skin gets really dry, I am talking ashy appearance dry even my usual lotion doesn't help at all. My face though is very oily if only it could spare some of that oil for the rest of my body.